Add a custom touch to your home with this Personalized 3 Section Wall Plaque. 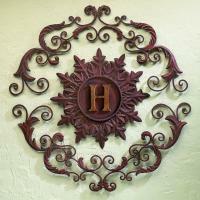 The decorative Tuscan wall grille features 2 scrolling metal plaques encircling your family initial. Sold by popular catalog retailers, it will be the focal point of any room you display it in. What a perfect accent for over a fireplace mantel, or a living room or entry wall. For more details visit www.cheapchicdecor.com.